Easter Widows, Seven Irish Women who lived in the shadow of the 1916 Rising. Published by Doubleday Ireland, 2014. “All changed, changed utterly. A terrible beauty is born”. Sinéad McCoole’s “Easter Widows” bears testament to the tragic poignancy of Yeats’ words. Her heart-rending account of the lives of the seven women whose husbands were executed in the aftermath of Easter 1916 portrays the brutal human consequences of that Easter’s immortalised events. McCoole’s seven widows are a fairly diverse set. It is hard to identify much in common between Kathleen Clarke and Maud Gonne McBride or the Gifford sisters and Lillie Connolly or any of the other women whose lives would be changed utterly by the Easter Rising. Their one shared feature was their love of men who would give their lives in the cause of Irish freedom. McCoole’s seven widows are a fairly diverse set. It is hard to identify much in common apart from love of men who would give their lives in the cause of Irish freedom. The over powering historical forces that brought such a diverse range women together in the heart of the nationalist cause is apparent in McCoole’s work. The emotions and ideas sparked by the Fenian uprisings, the Boers war and even Irish participation in British wars in India and Afghanistan that they would later view to be deeply unjust, all played a role in uniting disparate sections of Irish society in the cause of the nation. These historical events permeated the loves of McCoole’s seven widows. So too did the influence of those foremost in the Irish cause itself. Padraig Pearse’s St Enda’s school and the funeral of O’Donovan Rossa loom large in this text as formative events in the creation of the national movement that touched the lives of so many of this book’s protagonists. The 1916 proclamation begins by invoking “Irishmen and Irish women”. The Irishmen who led the Easter Rising have found their place amongst the pantheon of Irish heroes. Sadly, no such recognition has been given to the many women who played pivotal roles in Ireland’s struggle for independence. McCoole’s book is, therefore, an important contribution to the tale of the emergence of an independent Ireland. It seeks to recount the oft-neglected histories of some of the Irishwomen who rose to the proclamation’s call and go some small way to offset this historical imbalance. Not enough recognition has been given to the many women who played pivotal roles in Ireland’s struggle for independence. Some of McCoole’s Easter Widows were at the forefront of the independence struggle themselves. Maud Gonne’s contribution to the Irish cause equals, if not surpasses that of her, one-time, husband John McBride. Kathleen Clarke was to become a key leader in the post-Rising Sinn Féin, chairing Cumann na mBan and smuggling funds for on-the-run Minister of Finance Michael Collins. Like so many other Irishwomen at the time Áine Ceannt provided a crucial safe house for Collins and IRA members. Others had a lesser direct involvement but all played a necessary role in a facilitating their husband’s pursuit of an idealised vision of a free Ireland. Without their wives’ emotional (and oftentimes financial) support, without their acceptance of financial hardship, long absences and harassment from the authorities, without their shared belief in the cause of a free Ireland, the leaders of 1916 would have been unable to lead the Rising. And after the executions were finished, it was up to these seven women to pick up the pieces and provide for their families. This book is a vividly poignant account of figures who have played a largely forgotten role in the birth of the Irish state. There is intense emotional power in the telling of Grace’s marriage to Joseph Plunkett hours before his execution and of Muriel MacDonagh’s despairing death swimming out to plant an Irish flag a mile of the coast. Romanticism and abject tragedy are intertwined in this tale. As independence became close to a reality the vision of a utopian Gaelic Ireland, envisaged by many of those most devoted to the cause, was shattered. This work illustrates how the Irish nationalist movement lost a certain romanticism amidst the human tragedy of the 1916. As independence became close to a reality the vision of a utopian Gaelic Ireland, envisaged by many of those most devoted to the cause, was shattered. For these widows, and the many more who lost husbands, fathers, sons, no reality could ever be worthy of the loss of their loved ones. No state could ever compete with what they lost. It is notable that even as McCoole pieces together the stories of these women, much of the source material comes from the men whose deaths overshadowed their lives. It was their husbands’ who were recorded in the annals of history and their widows lives have largely had to be sewn together from scraps found in the margins of their lost husband’s histories. It is notable that despite McCoole’s best efforts, it has been impossible to escape from the reality that much of this history of women remains told through the eyes of the men in their lives. 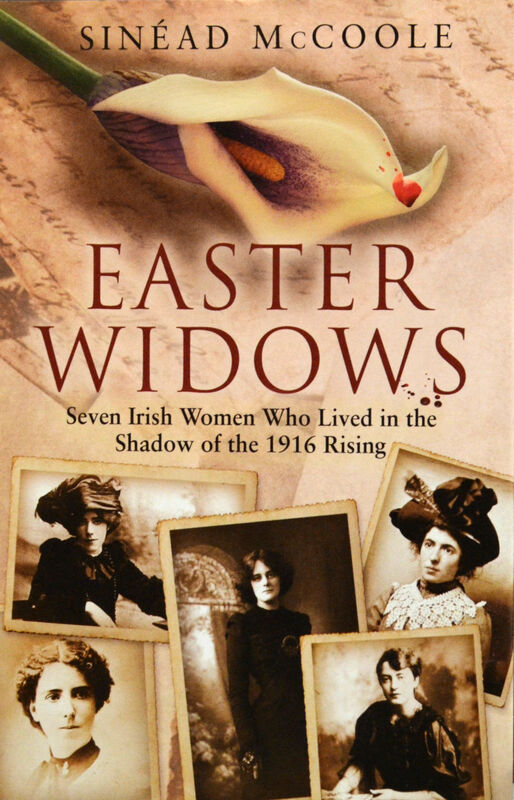 Coming up to the centenary of 1916, the Easter Widows is an important book. It not only highlights the role of women which has been largely marginalised in the intervening years but also poignantly illustrates the “terrible beauty” that birthed the Irish state.